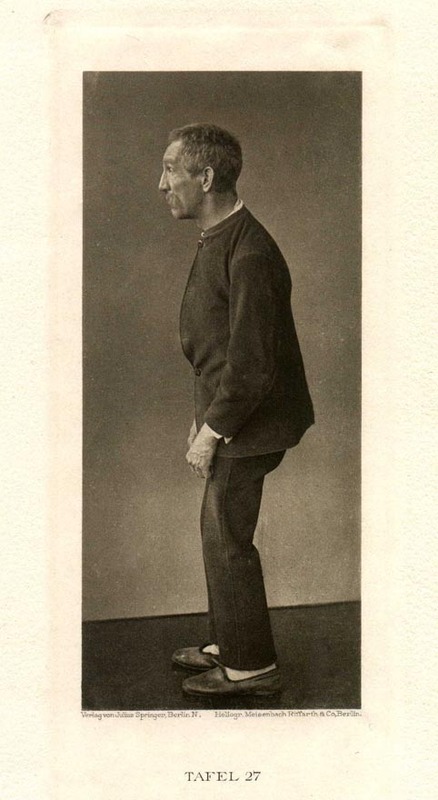 Very descriptive body posture in the stance of the patient: head and trunk stooped forward, gawking stupid physiognomy, the legs, moderately crooked at the knees, in a “knock-kneed” configuration. The arms, which are somewhat circumflex in the elbows, hands, finger joints, and knuckles, lie alongside the torso. 57 year old man, the gradual onset of this lengthy late term affliction dates back about 20 years.